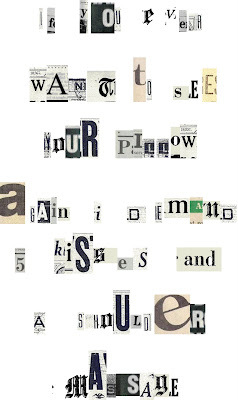 Have you ever sent your love a ransom note? If not, put this on the top of your to-do list. This is an idea that can be designed a million different ways to get out of it what you want. It gives the every-day just a touch of mystery and spontaneity (which is a big thing in marriage). I designed my "ransom night" as a way to get out of the house for a night out at a restaurant and movie. And, believe me...it was a lot more fun than the typical, “Hey Hunny, wanna go out to eat and catch a flick?” I made all the arrangements (restaurant reservations, movie tickets, etc.) so it'd be a fun night out…. I think he got the hint that this was a PLEA from me to get out of the house! This website allows you to type in your message and it prepares a ransom letter for you like this one. Cool, huh?! Use the ransom for a weekend getaway to a hotel or bed&breakfast. (This could work for a big event (birthday or anniversary--I think it's okay to splurge on these kind of things once in a while). "I have taken your ______ hostage. To get it back, follow these instructions. Pack a bag with everything you'll need for 2 days. There will be a tan car waiting for you in front of your house at 6:30. Put your suitcase in the trunk and get in the car. The keys will be there. Drive to 247 Charter Street where someone will be waiting for you." If I were doing this, I'd already have our room set up with candles, etc. and would meet him outside the hotel/b&b. I'd ask, "Did you bring the suitcase?" And then, just to add to the effect, I'd be holding a watergun to his side while I escorted him to the room and would say "don't try anything...if you cooperate, you will get your _______ back." Forget the ransom note, try a ransom phone call! Disguise your voice (they'll know it's you by caller ID) and say, "No one gets hurts if you do exactly as I say...."
ADORABLE! Hubs has a birthday coming up, and this would be perfect! Cute idea!Love the iPhone ransom idea above too. How fun! Thanks for stopping by today. I'm delighted to find your blog. We started something similar recently but it's still set on "private" until we're ready to release it all. I love finding other romance blogs...especially on a budget like our family with three little ones and (Lord willing) more to come. This is such a cute idea! I love your blog theme! It's different and fun! Thanks for stopping by over my way today! Have a great week! What a smart idea for a blog! We can always use some help in the romance dept! What a totally cool idea!!!!! Great idea! I wonder if I can print one off to ransom the children off to their grandparents for the weekend. Thanks for stopping by my blog- and yes, you are more than welcome to link. I think I've spent the last half hour looking at all of your fun ideas- thanks so much for the inspiration! What a GREAT idea. Love it!! Thanks for the link! Also, thank you SO much for stopping by for my SITS day last week! You left me some great comments! working on this one! I've picked the restaurant, just have to find a babysitter and a day off for my hubby! cute idea, thanks! I love this!!! Such a cute idea! I used this idea a few days ago. It totally took my husband by surprise and he loved it. Thanks for the cute idea!! I love this idea. My husband's mom's family did something like this when his aunt got married. They kidnapped her and her fiance couldn't get her back until he could tell them the names and artists of songs they played for him. 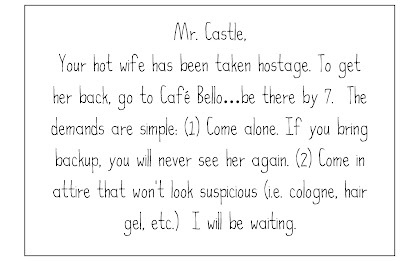 i just printed out a ransom note with the ransom generator...Mmmwaahahah (my evil laugh...lol) and can't wait to see his face tonight upon reading it...thanks for the tips! @ 14 years of marriage, these little fun things are always a great routine breaker.